A lot of smart alecks out there will tell you roulette is impossible to beat but this is a GamblingPlanet article and WE don’t scrimp when it comes to winning strategies. Believe it or not, there actually is a way - and a very surefire way - to take a giant bite out of the house and it doesn’t involve half the complexity of some of the betting systems we have on our other pages. But before we show you how to go about going for the kill, we first have to lay down a few basic tenants about the roulette wheel itself. Many believe that Blaise Pascal created the earliest form of roulette in the 17th century when he was trying to create a perpetual motion machine. The roulette wheel as we know it now is probably a hybrid of a gaming wheel invented in 1720 and the Italian game Biribi. The earliest description of a roulette wheel is found in a French novel entitled 'La Roulette, ou le Jour' by Jaques Lablee. This book describes a roulette wheel in the Palais Royal in Paris in 1796. This detailed description includes an explanation of the house pockets: "There are exactly two slots reserved for the bank, whence it derives its sole mathematical advantage." Published in 1801, this book stands as proof that the roulette wheel is at least over 200 years old. You see, just like a car, the roulette wheel is a mechanical device. They are manufactured somewhere, have distinctive makes and models and, inevitably, break down. For years, the roulette wheel was a hand-assembled work of art - like your Lamborghini Diablo or Ferrari F40 - they came from the workshops of craftsmen like Hans Benteler, Paul Tramble and B.C. Wills. Each of these men built in certain characteristics that, to the trained eye, indicated who the maker was. Benteler, for example, tended to build wheels with large frets so that the ball was trapped in a pocket shortly after dropping off the ball track. After Paul Tramble retired in 1996, most American casinos began importing their wheels from John Huxeley of London. The company, which normally makes Single-Zero wheels, still employs many of its Sing-Zero construction techniques when they produce their American models. Huxeley wheels, for instance, tend to have lower frets and no lip to their ball tracks. This makes certain strategies like computerized and visual prediction harder, but it doesn’t hurt bias players very much at all. What can cause problems, however, is that some newer wheels also have one-piece fret rings (i.e. the metal plates that divide the pockets are all part of one chunk of metal). As we’ll see, this tends to eliminate pocket-specific biases and raise the necessary exposure for bias players. 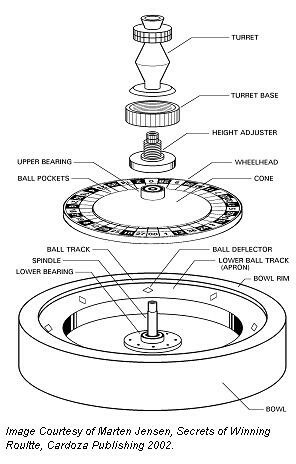 At any rate, all wheels have the same two basic components: the outer portion, known as the “bowl,” which includes the “ball track,” “apron,” “spindle” and “canoe stops,” and the “cylinder” or “wheelhead,” which is the central rotating piece that contains the pockets. The average bowl is about 32 inches in diameter (i.e., across the center) and, more often than not, the entire casing is cut into one piece of timber and coated in a veneer or laminate. The wheelhead is usually about 20 inches in diameter and fits neatly over the spindle. It spins on both upper and lower bearings, which are normally ball bearings but can also be needle bearings if the roulette wheel is cheaply constructed. The outer portion of the wheelhead contains the wheel's pockets, as well as pads marked with numbers corresponding to a standard layout. Beyond them, the wheelhead rises at a slight gradient (known as the “cone”), which terminates at the center with the “turret.” The turret itself is the piece a dealer uses to turn the wheelhead, but it also hides the height adjuster, which can be used to create or diminish a slight lip between the wheelhead and the apron. Although a statistician will tell you that each spin of a roulette wheel is totally unrelated to the next, this is technically untrue. On a live roulette wheel, at least, any of the tiny parts mentioned above can break down very easily because the average casino tends to spin its wheels thousands of times per day. Furthermore, because roulette wheel servicing is so expensive—both in hiring a specialist to fix the roulette wheel and in the money lost because it isn’t in use—they tend to hold out as long as possible before sending one off. Occasionally, in states where gaming-control boards practice “pickup” (i.e., they come to a casino unannounced and take a wheel away for inspection), the authorities will notice a bias first and notify the wheel’s owner. But, even then, the likelihood that the house will or can have the bias eliminated is very small. Often, a bias is so slight that no amount of fiddling will correct it, and from the casinos’ point of view, as long as the whole device is still making money, it’s not worth messing with. Of the several varieties of bias, there are two major varieties to look out for. The first is a wheel on which the ball consistently drops from the ball track at one or two specific sectors (delineated by the eight canoe-shaped deflectors inserted into the apron). This bias develops due to a casino’s neglecting to rotate the bowl as often as they should. As a result, the wear created by dealers' spinning the ball on the same side of the bowl will become more and more pronounced over time - and usually lead to a bias toward certain quadrants of the wheelhead itself. The other major type of bias is a pocket bias. This can occur for any number of reasons, but the two main reasons are that either the “pocket pad” (the piece of vinyl in the trough of a pocket) has become worn enough that it doesn’t provide sufficient bounce when the ball strikes it—or that a fret has become loose and has just enough wobble to absorb the momentum of the ball. The former of these two reasons is less likely to occur over time because on an evenly set wheel that hasn’t been tampered with, all pocket pads should wear at an equal rate. The latter, however, can occur from simple human carelessness—a service technician dropping a tool into the wheelhead while servicing it or a dealer being a little rough while spinning it. Of course, if the frets are all part of the same metal ring, this bias simply doesn’t exist. Any of these malfunctions can cause just enough bias that a wheel will tend to select a certain number or group of numbers more often than another. But because most players don’t realize a roulette wheel can become bias - let alone recognize when it is - it will continue to rake in money. You, on the other hand, are one of our loyal readers, and so we’re going to teach you exactly how to use this roulette version of card counting to take the other players' money for yourself. First off, let’s go back to that contiguous bet that was mentioned on our American Roulette page. If you remember correctly, we said that betting it by itself would inevitably lead to a loss. But that's just by itself. If, on the other hand, you are using it in conjunction with a bias—that is, the wheel is biased toward the two contiguous quadrants these bets produce—it is a surefire recipe for a wheel’s destruction. This is because, unlike other methods used for covering an uninterrupted string of numbers, this type of bet will keep your exposure extremely small (two checks on each of the regular double-street bets and one on the Basket) and, at the same time, seem like a dead-end method to casino personnel. They will, in fact, simply write off whatever you win as luck, believing you’re playing a system that generally doesn’t win. With that in mind, you’ll next begin “clocking” wheels for these two particular quadrants. This means going to casino after casino and writing down their wheels’ outcomes over hours and hours to see if there is a statistical variance large enough to indicate a bias toward our preselected group. You’ll bring a notepad and pen with you—which won’t particularly bother the casinos because they’re used to Labouchere players—and simply sit there, have a couple cocktails and write down the outcomes for all the wheels. Clocking multiple wheels will save you time in the long run because you’ll have to take a significantly large sampling from each of them at least twice before you can determine if they’re truly, statistically biased. But you should also always make sure you’re sitting close enough to see all their actual outcomes because, although most casinos have tote boards (the electronic display devices near the wheels), the listed numbers are often wrong. As for determining a bias itself, the Law of Large Numbers we mentioned above has come back with a vengeance. As you might remember, this mathematical concept dictates that, as the number of spins in a sample increases, the average number of times an outcome shows will get closer and closer to its ideal probability. There will always be a slight variance to this, which will be plus-or-minus 5 per cent of the total number of samples for straight-up bets and about 10 per cent for outside bets. But, if a number or group of numbers is hitting more often than that, you most certainly have a bias. Now, the average roulette wheel poops out about 105 spins per hour, so in about 10 hours you should be close to 1,000 spins. This is a large enough sampling to tell you if a certain set of outcomes is happening a significantly greater number of times than it should. The 25, for instance, should show up on a Double-Zero wheel about 30 times in 1,000 spins, and figuring for the possible variance of 5 per cent, you could possibly have as many as 80-100 hits on this number without there being any real bias. But say you’ve been clocking and you find out that the 25 has hit 125 times over the course of 1,000 spins—this is what we mean by statistically significant! If you start hitting numbers like this, that means you’ve got a winner and should next go into phase two of the clocking process: testing. Each time a number hits, put a checkmark in its column. This will make clocking much easier in that, rather than having to whip out a calculator, all you have to do is count the number of checkmarks for each number. Also, because most biases occur in quadrants, you’ll generally see a bell-shaped curve on your chart if the wheel is biased. In effect, then, you will be able to pinpoint a biased wheel within seconds of completing your sample and can walk up to it and write down any distinguishing marks it might have (i.e., a nick in the rim, a stain on the apron that looks like your grandma’s profile, whatever). When you come back the next day, simply locate the wheel you found the possible bias for, sit down and do another set of charts for it. If it again comes up that the numbers in our contiguous bets are hitting more often than the others, go ahead and begin playing them. If, on the other hand, the second set of charts doesn’t reveal a bias, the day before was just an anomaly and you should start the process all over. Clocking will eventually work if you follow the above steps correctly and are willing to put in the time necessary to watch multiple wheels. Moreover, casinos generally can’t do anything to stop you from writing down outcomes because they themselves post them. They are, however, very afraid of clockers because the good ones have broken the bank time and again. Take William T. Walters, for example, who used the method on a wheel in the Golden Nugget. By the end of the day, he walked out $3.8 million richer, and not long afterwards, the casino was bought out by Bally’s. Now, obviously, this system will not work for online gaming establishments whose computer-generated wheels are nothing more than programs. That being said, though, eventually an enterprising hacker will find a way to break into their systems, rewrite the code and beat the pants off them. After all, there will always be ways to get one over on the house, as long as folks like Bill Walters, Ed Thorpe and, now, you are willing to put the time and effort into doing so. 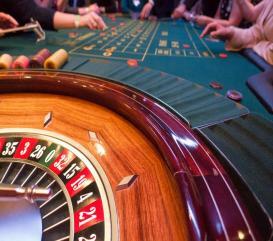 Throughout history, different methods have been used to monitor the roulette wheel. These methods can be divided into three main categories which correspond with the three building blocks of the game: the wheel, the dealer and the ball. We have already spoken about exploiting the wheel but what we haven't spoken about is the rather fabulous Joseph Jagger aka ‘The Man Who Broke the Bank at Monte Carlo’. Joseph Jagger was a British engineer who lived in the 19th century. He used his mechanical knowledge to study the behavior of the roulette wheel after he realized that the outcome may not be entirely random, but rather influenced by mechanical imbalances. In 1873 Jagger put his theory to the test. He traveled to the Beaux-Arts Casino at Monte Carlo, Monaco, where there were six roulette wheels at the time. He hired six clerks, one for each wheel, and asked them to secretly record the outcome of each wheel. When he went over the results, Jagger was thrilled to find that one of the wheels showed a clear bias. 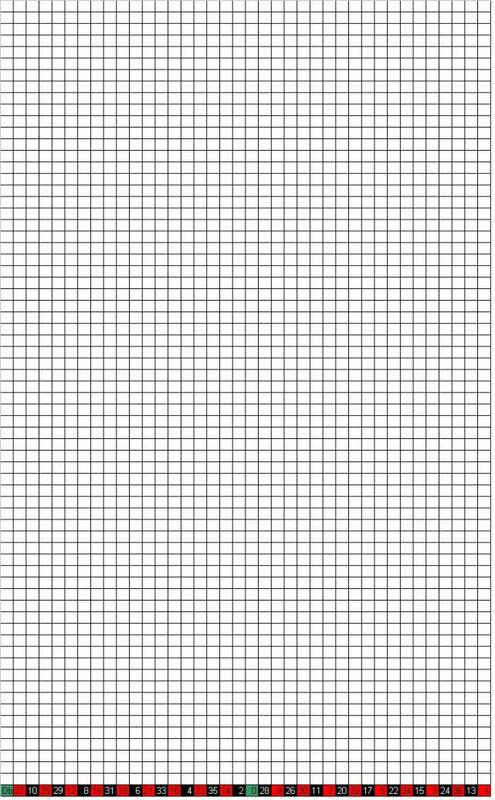 Nine of the numbers - 7, 8, 9, 17, 18, 19, 22, 28 and 29 – came up more frequently than others. After nearly two years of monitoring, Jagger was ready to make his move. Jagger placed his bets according to his findings and won £14,000 during the first day, which is the equivalent of approximately £750,000 nowadays. Over the next three days, Jagger won a total of £60,000 in earnings. Other gamblers in town started imitating his bets, and the casino was hit hard. In response, the casino switched between the wheels, and Jagger’s winning streak came to a halt. He later remembered that the biased wheel had a scratch on its surface, and once he relocated it he resumed his winnings. The casino finally rearranged the wheel completely, and even went as far as switching the numbers of the slots daily. Jagger took his winnings, around £3,250,000 in current value, and left Monte Carlo never to return. Though modern casinos have eliminated biased wheels (or at least they think they have), the human factor of the game still exists. Some gamblers believe that there are dealers who spin the wheel in such a way that makes it more likely for some numbers to come up. They do this either consciously or unconsciously and these ‘patterns’ or ‘signatures can be read by astute gamblers, who can then place their bets around a certain area of the wheel. Sometimes, it really is just a matter of keeping your eye on the wheel! Speaking of keeping your eye on the wheel, maybe you should do the same with the ball or rather, spend some time closely monitoring it to accurately predict where it will land. The technique focuses on three events: Predicting where the ball falls from the track, predicting the position of the wheel when the ball falls, and predicting how far the ball would bounce when it finally strikes the wheel. Laurance Scott, who is known in some circles as ‘the God of Roulette’, is the person who is usually associated with inventing and capitalizing on this technique. Though he has reportedly been using these methods for over 15 years, there is no accurate account of his winnings to date. Scott put out a series of books titled ‘Professional Roulette Prediction’ which explain his methods in great detail. It is important to note that with new, modern times have come new, innovative techniques of trying to beat the wheel at its own game. Modern enthusiasts have been using hidden cameras, sophisticated lasers and small computers to better track and monitor roulette behavior. Most notably, Gonzalo Garcia-Pelayo used a computer to model the tendencies of the roulette wheels at the Casino de Madrid in Madrid, Spain during the early 1990s. 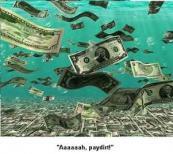 Over a period of several years and with the help of his family he reportedly won over $1 million US dollars. After the casino sued him for using illegal methods to beat the casino, the court ruled in his favor and Gonzalo kept his winnings. Why not start turning that Roulette Wheel today! As you can see from everything which we have spoken about above, it is actually possible to beat the house at its own game - all you need to do is keep your eye on the mechanical wheel and take note of what is going on. However, if Online Roulette is your poison of choice and you don't have the energy to go down to your local brick and mortar casino, even though we don't have any cheeky solution to your problem, here at GamblingPlanet we still have the best bonuses for you to peruse and make use of. So, why not visit our Roulette Strategy page and start your Roulette Champion journey today!